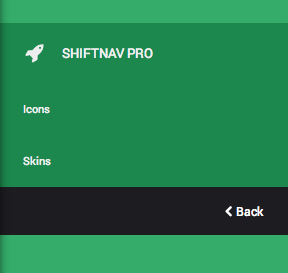 In ShiftNav (free), there will only be one option: Always visible. The submenu items will always be showing (you can choose to indent them in the menu settings). 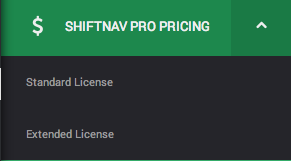 ShiftNav Pro offers two additional types of submenus – accordion and shift submenus. 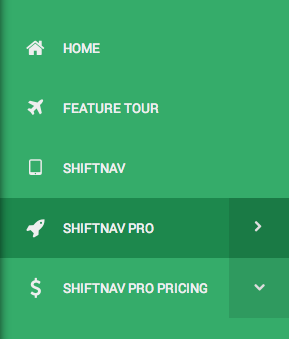 In the ShiftNav Control Panel, you can set a default Submenu Type. This submenu type will be used by any item in this ShiftNav instance that has its individual submenu type set to “Menu Default”. The individual item’s submenu type is set to Menu Default by default, so this will affect any menu items which have not had their Submenu Type Default set explicitly. The submenu type can also be set on individual menu items in the menu item settings. The default is Menu Default, which will inherit the global setting from the Control Panel. Accordion submenus are closed by touching the arrow to retract the submenu. Shift Submenus shift a new panel over the top of the existing menu, so that only the parent menu item and its submenu become visible. Shift submenus are designated by a right-arrow. Shift submenus are closed by touching the Back button in the menu.